Thanks to a $1.5 million gift from India’s Ministry of Culture, the University of Chicago has established a new chair in Indian Studies commemorating the legacy of the Hindu spiritual leader Swami Vivekananda. 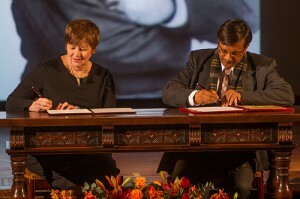 The Indian Ministry of Culture Vivekananda Visiting Professorship will be given to distinguished scholars from a variety of disciplines with an interest in the fields of study most relevant to the teachings and philosophies of the Swami, such as Indian philosophy, politics and social movements. The professorship, which the Division of the Humanities will administer, includes a teaching commitment as well as an annual public lecture. Read the University News Office story here. Posted in Uncategorized. Tagged with South Asian Languages & Civilizations, vivekananda.